The Granite Gear Zippsack is one of several storage or packing systems that are offered by the manufacturer. 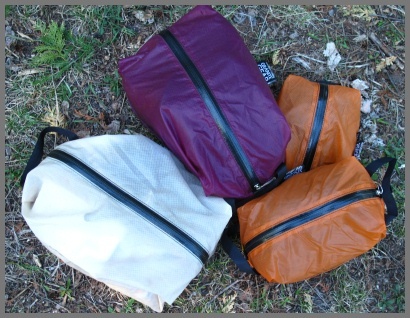 The Zippsack is an ultralight zippered-storage container. It looks much like a traditional men's toiletries case that has a three-dimensional rectangular shape with a zippered top. The Air Zippsack (formerly known as the Air Space) comes in several sizes from XXS to M.
The Zippsack is made out of 30D Sil Cordura Nylon. The fabric weight is light and the color is almost translucent. A waterproof black YKK zipper runs the center of the length of the top. The zipper pull has a small micro-cord attached. The seams of the sack are fully finished. One end of the sack has a black 9.5 in (24 cm) long grosgrain ribbon, sewed into a loop and inserted into the seam. The Air Zippsacks have helped to replace a traditional packing system of stuff sacks to compartmentalize my pack. Although it does not compress the items stored such as some types of stuff sacks would do, I find that I can squeeze and compress them anywhere in my backpack and they conform to the space available. 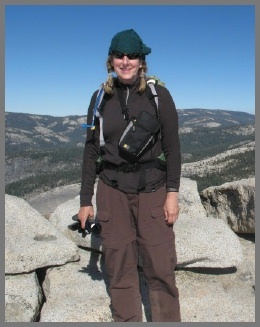 In addition, I have also utilized the Air Zippsacks on a multitude of day hike excursions to hold my rain gear, hat, gloves and more. This allowed me to grab these items quickly when needed, out of my otherwise unorganized day pack. Accessibility: This is the #1 asset to me. Each Air Zippsack has a waterproof zipper across the entire length of the top. This type of zipper eliminates the need for a zipper flap as it will keep most water out if fully closed. On my size small Air Zippsack, the zipper measures 17.25 in (44 cm). While the total length of the size small Air Zippsack is 12 in (30 cm), the additional zipper length is divided equally half-way down both the "end" panels of the sack. I have total access to the goods that I store in each Air Zippsack. I never have to empty the contents of a traditional stuff sack to find the item at the bottom of the bag. I normally utilize one or two Air Zippsacks during each trip to hold my food and several others to hold incidentals and extra clothing. Smaller items such as socks are never "lost" anymore in an attempt to retrieve them. Water-resistant: The Air Zippsack is touted as being water-resistant. The "bathtub" construction of the bag means no seams can leak when set on a wet surface. 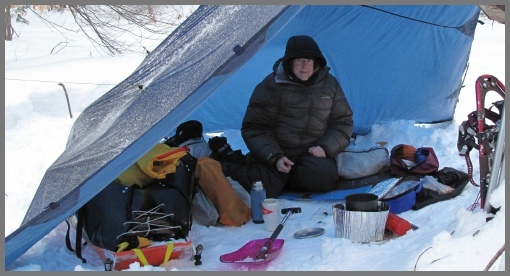 Since I have unpacked or packed my backpack in many adverse conditions, I appreciate that fact that I can unpack the items and expose them to the elements without worry. More times than not I have placed them on the wet ground as well without an issue. In combination with the waterproof zipper and water-resistant fabric, I have never had a problem with any of my contents getting wet when used in the above manner. 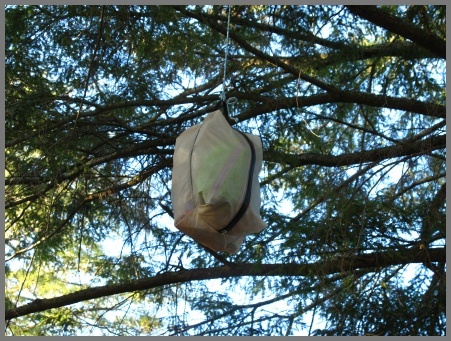 Because I use a couple of my Zippsacks for food storage they are bear hung (using the grosgrain loop on one end of the sack for rope attachment). I always pack my food in Ziploc brand storage bags inside the Zippsack. I have found some moisture inside the Zippsack when used for many hours of exposure to severe weather. It's possible that some moisture infiltrated through the fabric or it could just be condensation. Shape of Air Zippsack: The boxy-rectangular shape of the Air Zippsack makes packing so efficient. It easily conforms to whatever space I place it in my backpack. If I have to pull it out, it is easily retrieved by pulling on the grosgrain-loop handle which is attached to one end. The slippery surface of the Sil-Nylon does not displace other items in the pack when extracting what I need. Weight: The Air Zippsack is made out of a super-light Sil-Nylon. The weight savings over many traditional storage sacks add up to a significant amount. The total weight for a roomy size small Air Zippsack is 1.4 oz (40 g). Fully finished seams: All of the seams in an Air Zippsack are impeccably encased in black Nylon. During extended use of 500 plus nights, I haven't experienced any malfunction in the construction of the seams - there are no tears, rips or stress points. Durability: What more can I say here...after over 500 nights, they are still amazingly perfect. Occasionally I have thrown them in the washing machine and they have cleaned up very well, that is especially noticeable on the white ones that I own. Although the majority of my backcountry trips were in the state of Michigan, USA, I have also traveled to many hiking destinations in Canada and various places stretching from California to New Hampshire in the USA. Much of my area of travel covered hilly boreal and deciduous forests, tundra, mountains as well as frozen lakes. Elevations have ranged from over 600 ft (183 m) to 14,000 ft (4267 m) and temperatures ranged from a low of -31 F (-35 C) to about 95 F (35 C). I really really love the Air Zippsacks! Not only has it made my life much easier, it is truly a quality product. Although I have changed every other piece of my gear in my backpack through the years, the Granite Gear Air Zippsacks have remained. This year I purchased some new products in the same line (Air ZippDitty). They are much smaller versions of the Air Zippsacks and I am excited for all the possibilities!